Zippered duffels are usually water resistant at best, but these roll top Dry Pak duffels take waterproof to a whole new level. Shut out water by rolling down the top a few times and snapping the side release buckles together. Unroll and open to enjoy the huge tapered access opening on top. Items are easy to pack and easy to retrieve. There’s a convenient water resistant zippered pocket with storm flap on each side, one clear, one opaque. The shoulder strap is removable, adjustable, and padded for comfort and convenience. 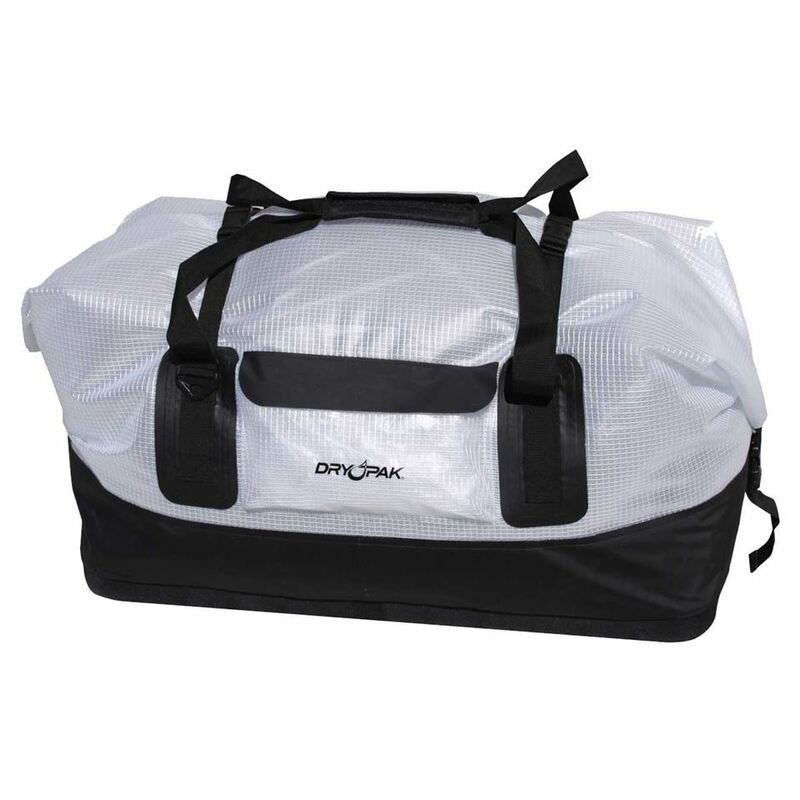 The waterproof duffel bag is great for boating, paddlesports, camping, and scent proof storage for hunting. This product is quality manufactured from extra heavy–duty vinyl/polyester laminate with electronically welded seams; there are no leaky sewn seams to seal. The molded bottom adds structure and protection to contents. The high end plastic hardware ensures long life. When it comes down to it, why would you want to risk getting anything wet if you don't have to? The DRY PAK Waterproof Large Duffel Bag takes this to the logical end and allows you to pack it all up in one clever waterproof duffel bag. A simple rolling and snapping mechanism lets you seal out water completely, and unroll to have wide access to your dry stuff inside. The bag is crafted from durable vinyl and polyester laminate with electronic welded seams, meaning no part is going to let the water in. Exterior pockets and a storm flap on each side create further protection and convenience. The bag is even scent proof for use on camping or hunting trips.